In all of my muffin making lately in preparation for Muffin Week with my blogging pals, I’ve had to swallow a very difficult realization. My son prefers blueberry muffins to strawberry muffins. 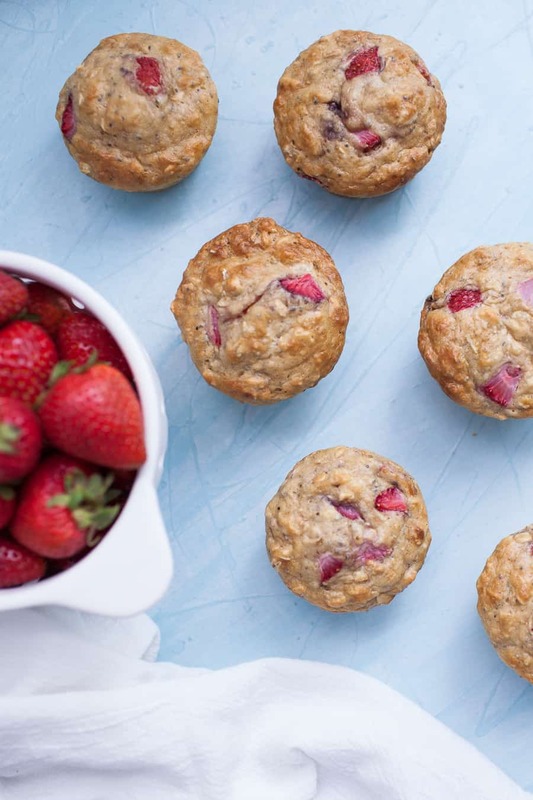 Now, I can’t really blame him since he was practically raised on blueberries in utero, but I just think there is nothing better than a warm strawberry muffin! But then again, he prefers his muffins (and most food these days) to be cold. Which is just weird. Toddlers are just weird though, right? 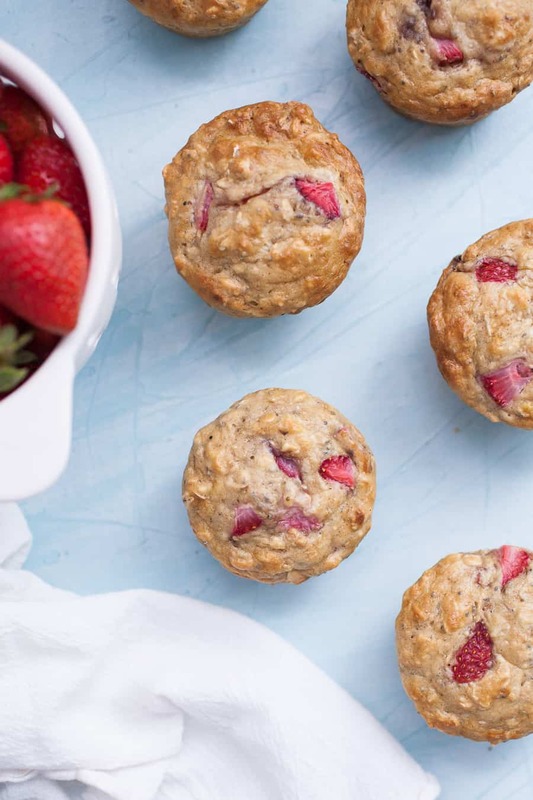 Why start your week off by baking a batch of muffins? 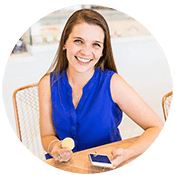 Well, they just happen to be the perfect little snack. 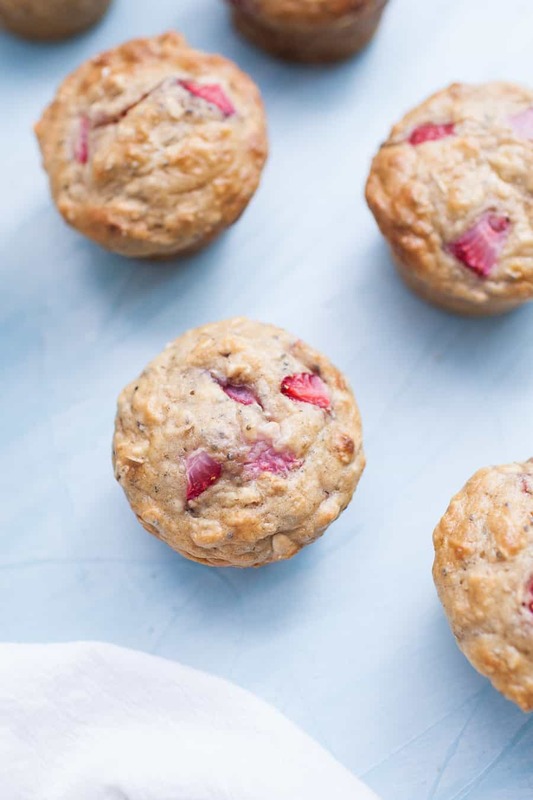 Even though these No Sugar Added Strawberry Chia Seed Muffins are super simple to make, they’re packed with a lot of great things. Healthy fat from the yogurt, omega-3 fatty acids and so many other benefits from the chia seeds, plus NO SUGAR ADDED. The reason they don’t have sugar added to them is simply that they do not need them. The sweetness of the applesauce and the strawberries is plenty of sweetness! If you aren’t used to eating baked goods with no sugar added, you can add extra maple syrup to help add some sweetness. One of the ways I often bake things is that I come up with an idea and then find 3 or 4 recipes that I can combine in order to achieve what I want. 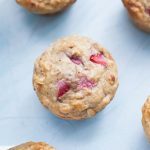 In this case, the initial inspiration for this recipe came from a guest post my friend Jenna did for me many years ago for Blueberry Chia Seed Muffins. I wanted to combine that recipe with my No Sugar Added Strawberry Muffins and the base recipe for my Healthy Lemon Blueberry Muffins. Now that I’ve been making muffins weekly pretty consistently for over a year, I feel like I’ve got my bases covered when I want to make a new recipe flavor. Which is a pretty cool feeling to have! 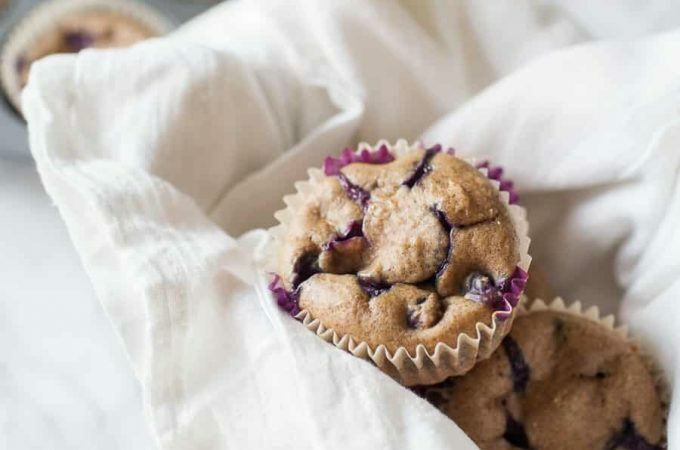 How should you store muffins? Let muffins cool completely on a wire rack. Then line a large storage container with paper towels and place cooled muffins on top. Then place another paper towel on top. This helps the muffins from getting too moist and spoiling. Change out paper towels if they become moist. Store at room temperature and eat within 2-3 days. If they aren’t going to be eaten within that time, I recommend freezing them instead. How do you freeze muffins? Let muffins cool completely, then store in an airtight container. Then individually wrap muffins or freeze a batch of them in a zip top bag. Thaw at room temperature or reheat in oven to thaw. Do muffins need to be refrigerated? They don’t need to be but if you aren’t going to eat them in a few days max, I’d recommend freezing or at the least refrigerating them so they do not go bad. Muffins are the preferred texture at room temperature, so refrigerating them isn’t ideal but will help them last longer. Especially with fresh fruit, proper storage is really important. Usually for blueberry muffins I would say yes, but I would guess for strawberries it would be tricky. 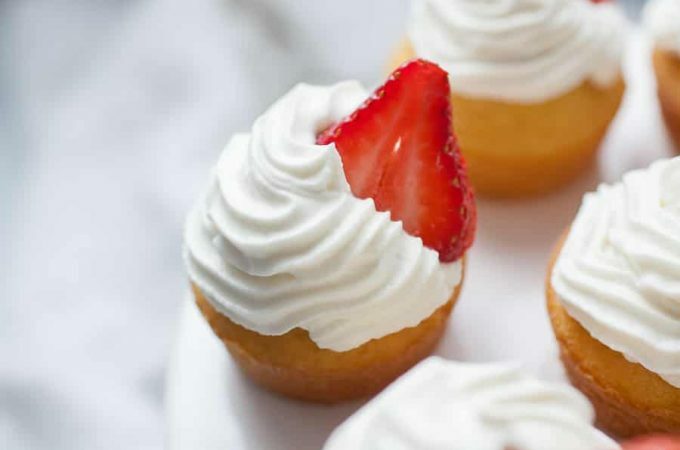 Strawberries already have so much liquid in them that using frozen strawberries might just add too much liquid to the batter. But if you try it out, let me know! What can I use instead of strawberries? 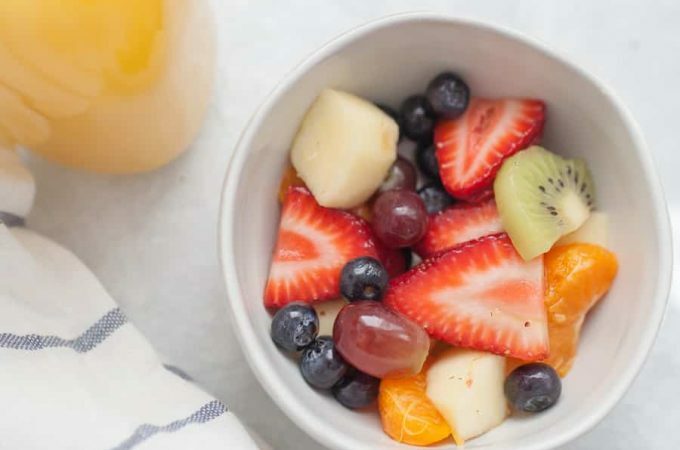 You can substitute blueberries or dried fruit like apricots. Don’t be afraid to be creative! 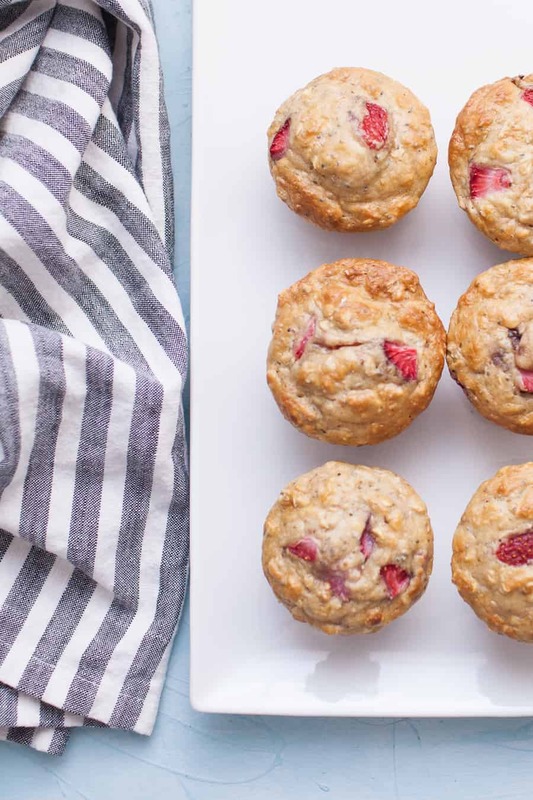 What else can I serve with Strawberry Chia Seed Muffins? If it’s for brunch, make this Baked Egg Casserole or Spinach Veggie Casserole to serve with the muffins. If it’s for a playdate, maybe this Toddler Friendly Kale Fruit Smoothie. Another thing I love to do is do a half batch of one kind of muffin and a half batch of another. 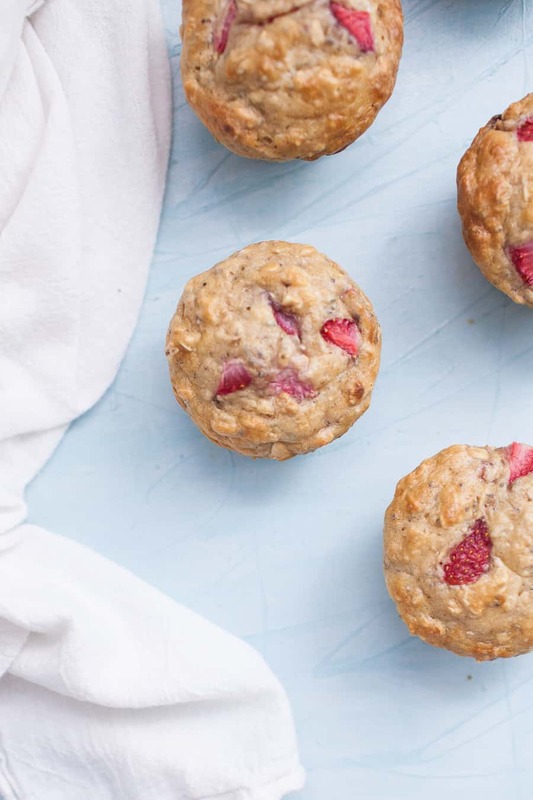 This recipe for Healthy Banana Chocolate Chip Yogurt Muffins is perfect to split a muffin pan. Save this recipe and make it later! As always, if you make this recipe, I’d love to know how they turn out! Leave a comment with a rating on this recipe to share your thoughts. Preheat oven to 375. 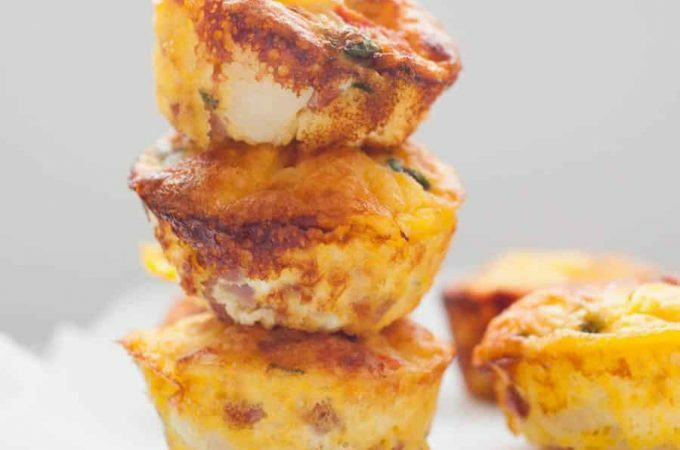 Prepare and grease a 12 cup muffin tin. In a large mixing bowl, combine flour, oats, aluminum free baking powder, baking soda, cinnamon, and salt. In a glass liquid measuring cup, combine remaining ingredients, except for the strawberries and chia seeds. Create a space in the center of the bowl. Pour ingredients into the bowl and gently mix ingredients with a silicone spatula. 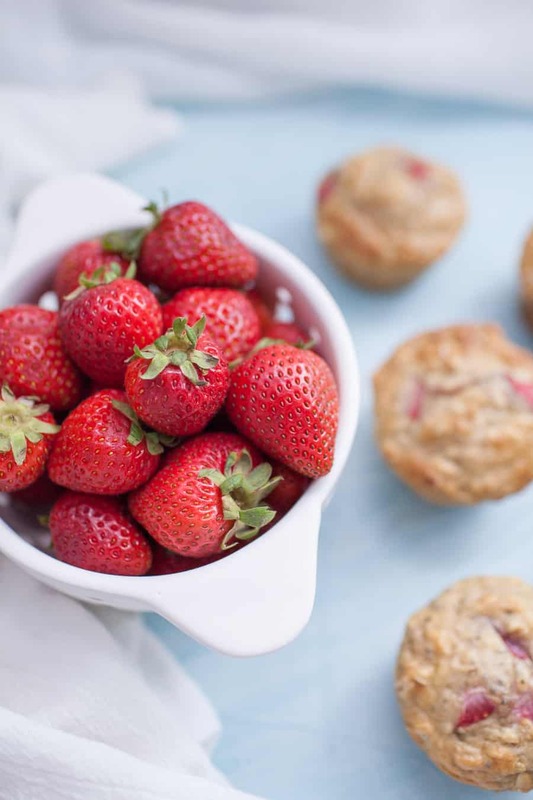 Gently fold in strawberries and chia seeds. Use a cookie scoop or 1/4 cup measuring cup to scoop batter into a greased or lined muffin tin, filling cups about 3/4 of the way full. Bake muffins for 20-22 minutes, until muffins bounce back when gently touched. Allow muffins to cool in pan for 3 minutes, then move to a wire baking rack to completely cool. Store in an airtight container, lined with paper towels, for up to 3 days. I love your muffin recipes! This sounds like a winner for sure. I can’t wait to make it! Love that these have no sugar added! 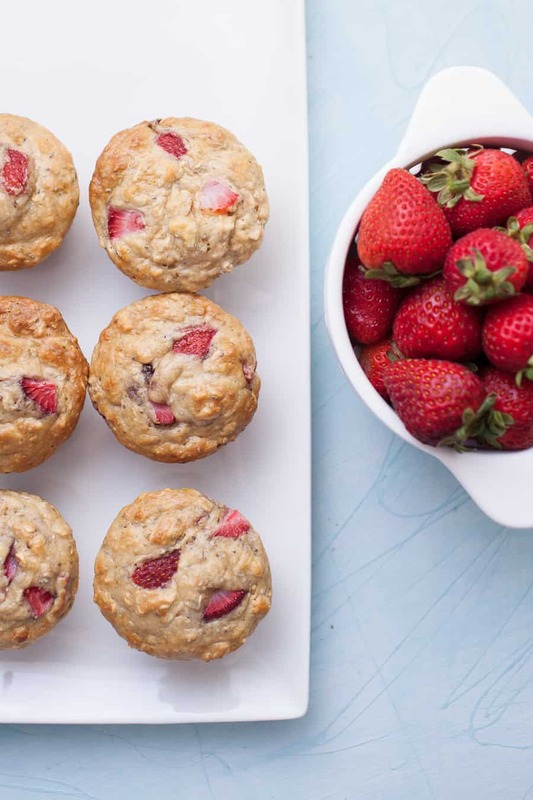 I love strawberries in muffins too, but I must admit, I haven’t made strawberry muffins in a while! My go-to lately is blueberry. I may need to add these to the baking list! Thanks for sharing your thoughts about Transformers giochi di ragazzi. Has anyone tried making these yet? I made them today, and I don’t taste a lot of flavor of any kind. I was really excited for the no sugar added too but all I taste is flour. Thank you! Hi Courtney! I’m sorry that they didn’t come out the way you expected. 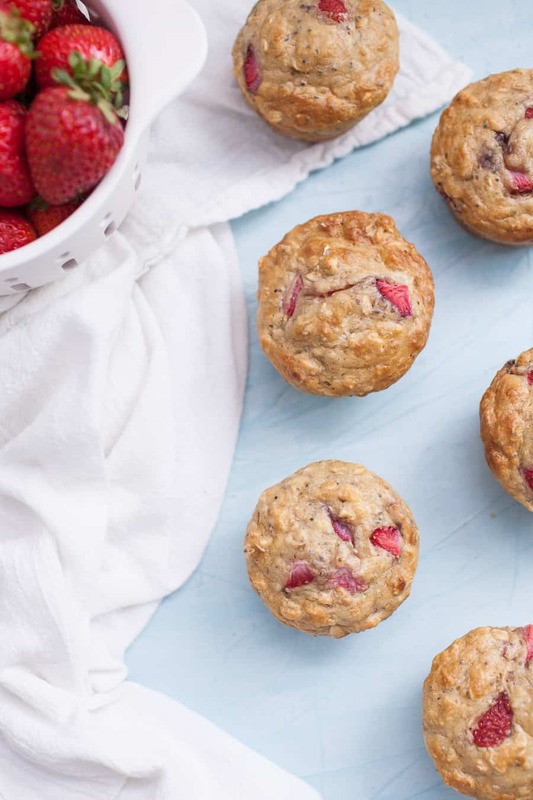 Strawberries aren’t in season right now, which may have made these muffins less sweet than you expected. If you want them to be sweeter, just add in a tablespoon of maple syrup.